So I came upon this interesting image in the archives of the Tucson Historic Preservation Foundation. 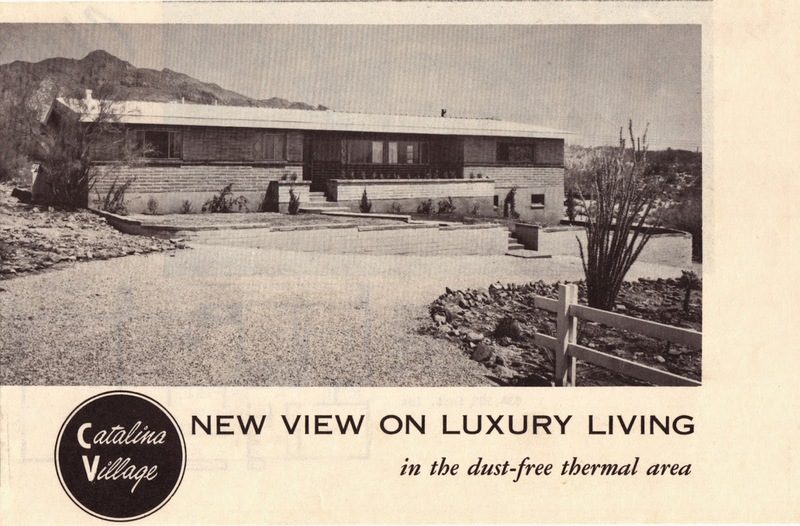 Included in their archive of "mid-century ephemera" is this home builder's brochure for homes in a neighborhood designated as Catalina Village. The homes were listed at $34,500! And what on earth is that tagline all about - "in the dust-free thermal area." Huh? My kingdom for a tree. Where is Catalina Village? Did you figure that out? Hi Roseann! No, not yet. The only address on the brochure was the builder's office. So far I found a senior retirement home called Catalina Village but that's all! Love this vintage look at baby Tucson before it grew up! I looked up the Preservation website and found the 3 page image for Catalina Village that you found, but also had no luck in tracing the place...it seems that none of the contractor's exist in Tucson anymore and there is no such subdivision. Maybe the picture was of a spec house, the only one of it's kind and it didn't sell so well?? Wouldn't it be fun to find it?!! The other "ephemera" images are equally as interesting. Thanks for blogging on this:-) Oh, and the next time someone asks you if it's hot, just say "Yup, the thermals are high, but it's a dry (aka dust-free) heat." Say, what?! !